This painting is on wood and painted in acrylics,its huge measuring one and half metres long and one metre tall. Elen of the ways walks on the leylines bringing new energy forth,she holds a bundle of mushrooms and toadstools,used by shamans of old to open up the pineal gland and see through the veils,She has an ermine wrapped around her shoulder representing wealth on all levels,A new portal is opening up above her crown chakra allowing the ancient energy to pour down to Earth. 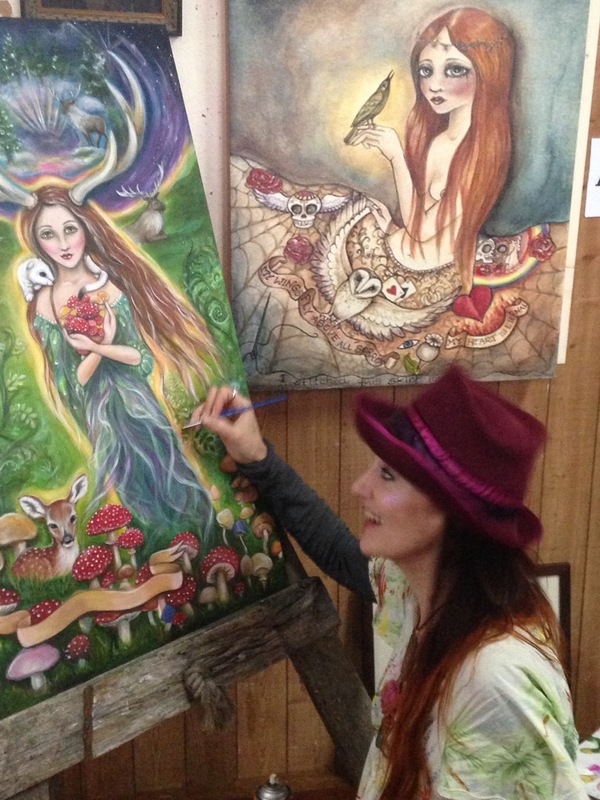 The BOHEMIAN ANIMAL TAROT wins international award! THE BOHEMIAN ANIMAL TAROT TAKES OUT INTERNATIONAL AWARD !! I was so happy to hear the news that our Tarot was nominated for 5 awards at the international CARTA awards.i was nominated for the best artist in a tarot deck and was up against 4 other fantastic artists,we were also nominated for Best collaboration on a tarot,Best Divine writer,and the Llewellyn publishing award for best tarot,The results were Scott taking out the BEST author for a tarot award! We are both so proud and honoured to be recognised for our hard work and honoured that Scott won his award.